Facebook has begun testing its new automatic photo upload service on a small sample of iOS app users. The Photo Sync feature, which was tested on some Android app users in September, will upload all photos taken with the device's camera to the social network as soon as the picture is taken. While that may be a terrifying prospect for those snapping more than just beautiful landscapes, cats and cheesecake, Photo Sync will not post photos directly to the user's Timeline without approval. 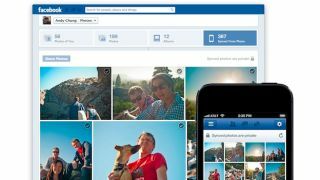 Instead all photos will be stored in a private folder within the Facebook user's photo albums, where the decision can be made on whether to make them public or share with pals via direct message. The idea is to simplify the process of uploading photos to the social network and takes its lead from the Google+ Instant Upload feature. "Only you can see the photos you've synced from your phone. Your photos are saved privately in a section of your Facebook Photos that only you can see. When you view your synced photos, you can choose shots to share or send in a private message," said a post on the Facebook help pages. Photo Sync works over both Wi-Fi and mobile internet, but the data-conscious user can also configure the service to sync only using Wi-Fi. To check if you're one of the few users currently able to test the feature, open the Facebook app, load the left-sided list menu, scroll down to Apps and select Photos. If you see 'Sync' at the bottom of the page, it can be enabled.